The EHANG184 vehicle is fitted with a touchscreen to the front of the passenger seat displaying a map of all destinations in the form of dots. It has preset routes and the rider is to select the intended destination. The vehicle will then start automatic operation, take off and cruise to the set destination before descending and landing in a specific spot. A ground control center will monitor and control the entire operation. Mattar Al Tayer, Director General and Chairman of the Board of Executive Directors of RTA said: “The trial run of the first AAV is in implementation of the directives of His Highness Shaikh Mohammed Bin Rashid Al Maktoum, Vice-President and Prime Minister of the UAE and Ruler of Dubai, to transform Dubai into the smartest city in the world. "It is also part of RTA’s endeavors to provide self-driving transport through engaging in the technological tests of self-driving vehicles under Dubai environment. It replicates Dubai Self-driving Transport Strategy aimed at transforming 25% of total individual trips in Dubai into Self-driving trips using various modes of transport by 2030. "The step would also enhance the integration between public transport modes and people happiness through the provision of smooth, quick and innovative mobility. 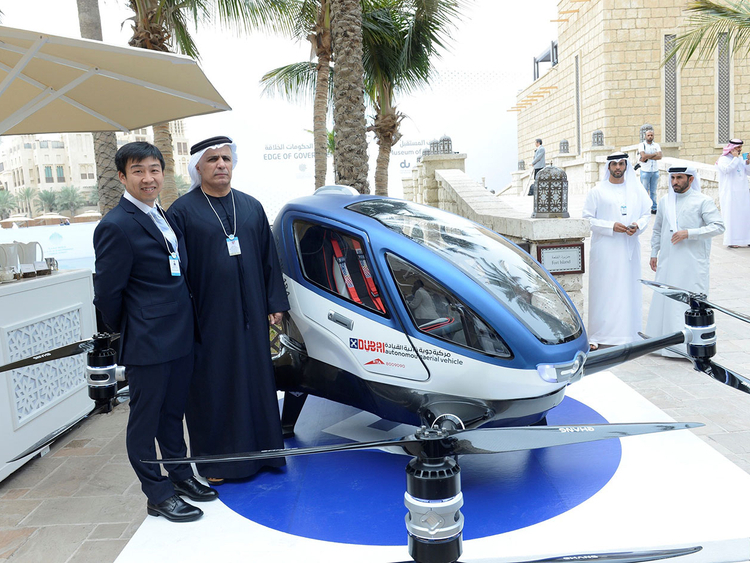 “The AAV exhibited at the World Government Summit is not just a model; it is a real version that we have already experimented the vehicle in a flight in Dubai sky. The RTA is making every effort to start the operation of the AAV in July 2017,” reported Al Tayer. “We have addressed the highest levels of security in the designing and manufacturing of the EHANG184. The vehicle is fitted with eight main propellers, where each propeller would operate at a time, and the systems are separated from the contents of the vehicle. "In case of any failure in the first propeller, there would be seven other propellers ready to complete the flight and a smooth landing, while mitigating the impact of the fault sustained by the first propeller," Al Tayer said. "The AAV is fitted with numerous basic systems all in operation at the same time, though independently. In case of any malfunctioning in one of these systems, the standby system would be capable of controlling and safely steering the AAV to the programmed landing point,” he added. “The AAV is designed to fly for maximum 30 minutes at a maximum cruising speed of 160 km/h, and the standard speed shall be 100 km/h. The ascending/descending speed is about 6 meters per second and the landing speed is 4m/s. The AAV measures 3.9 m in length, 4.02 m in width and 1.60 m in height. It weighs about 250 kg and 360 with a passenger. The maximum cruising height is 3000 feet and the battery charging time is 1-2 hours. The AAV is designed to operate under all climatic conditions unless there is a thunderstorm. The vehicle is fitted with highly accurate sensors with a very low-error threshold and can resist vibrations and extreme temperatures. “Dubai Civil Aviation Authority was a partner in our trials defining the safety criteria required, issuing the permits for trial and inspecting the vehicle, RTA appreciates their contribution. Etisalat had contributed as well to the success of the test run of the AAV in its capacity as a prime network provider. The 4G data network is used in communication between the AAV and the ground control center. The Company had also provided the support needed to ensure the continued communication between the AAV and the Control Center through M2M and LTE technologies,” explained Al Tayer. He noted that the successful operation of AAV is considered a big step towards innovative and smart mobility solutions for reducing city traffic congestions.